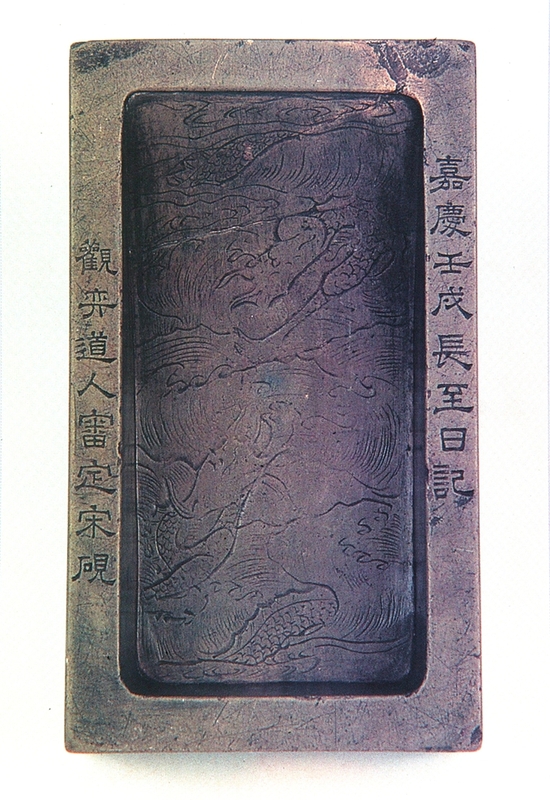 Chengni inkslabs were one of the four most famous types of Chinese inkslabs. 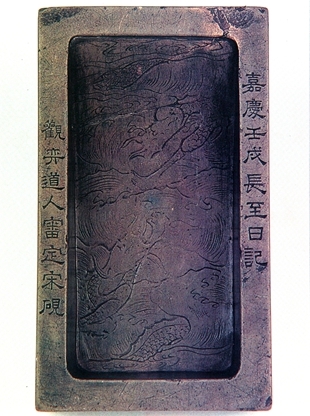 Chengni inkslabs were one of the four most famous types of Chinese inkslabs. Produced in Jiang County in Shanxi, they are made of mud from the bottom of Fenhe River, which was air-dried and baked hard. They are capable of producing fine ink and retaining ink or water for a long time. This exquisitely wrought reddish brown inkslab is shaped like a peach, with two leaves forming a flat-bottomed water reservoir in-between. Taohe stones, of which this inkslab is made, were named after it origin in Taohe River in Gansu. Taohe stones, of which this inkslab is made, were named after it origin in Taohe River in Gansu. Their exploitation, which started in Song Dynasty, was very difficult because they were usually found at places with deep water and rapid currents. As Zhao Xigu, a man in Song Dynasty, wrote, "Besides Duan and She stones, Taohe stones were the most valuable in the north. Green and smooth, they could be made into top-quality inkslabs. However, lying on the bed of the deep river, they are very hard to obtain and are therefore priceless." For that reason, few Taohe inkslabs have been handed down. This inkslab, with a fine, smooth texture and a light green color with a yellow tint, is among the best of its kind. Simply shaped, it is bordered with lifelike dragons playing with water in shallow relief. It used to be in the possession of Ji Xiaolan (1724~1805), a Qing scholar from Xian County in Hebei. He was the chief compiler of Complete Library of the Four Treasuries (Siku quanshu), and the complier of Annotated Catalogue of the Complete Library of the Four Treasuries (Siku quanshu zongmu tiyao). 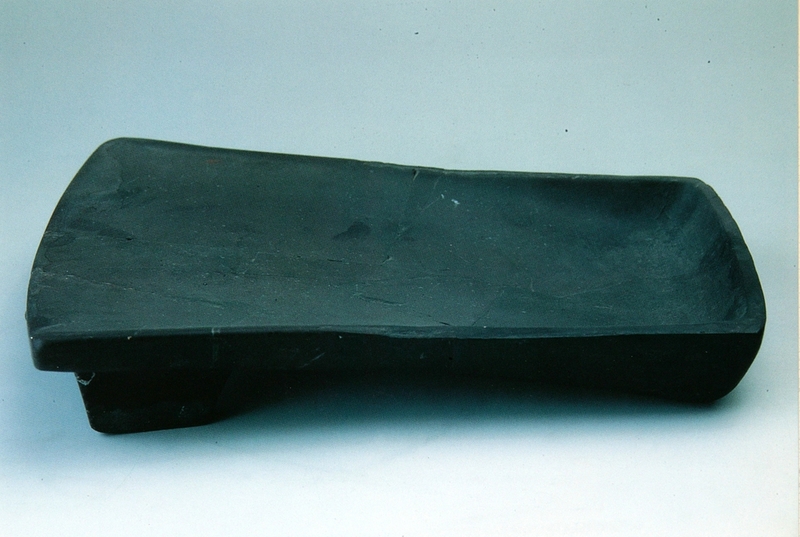 Made of bluestone, this inkslab, with slanting sides, is adorned with curved lines on the front. It has two inkwells and a chamber underneath, with traces of smoke left inside. Made of bluestone, this inkslab, with slanting sides, is adorned with curved lines on the front. It has two inkwells and a chamber underneath, with traces of smoke left inside. The chamber, used for heating, is grayish white from burning. There are black and red traces in the inkwells. Inkslabs designed like this one are rare and peculiar to cold northern regions. 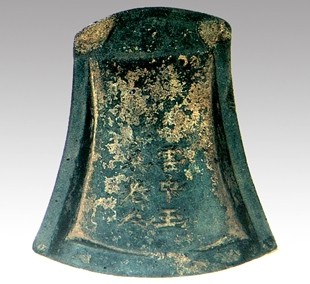 It was unearthed at a Yuan Dynasty site east of Deshengmen Gate in Beijing. This is a black chengni inkslab imitating Song dustpan-shaped inkslabs. There is an inscription in official script on the reverse. 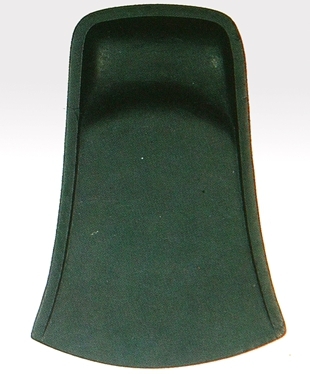 This is a black chengni inkslab imitating Song dustpan-shaped inkslabs. There is an inscription in official script on the reverse, which contains the words Yunzhong Yuquan Laoren, the fancy name of Yelü Chucai, an eminent minister and statesman of Mongolia. Yelü Chucai (1190~1244), Jinqing by courtesy name, was a Khitan. He was the ninth-generation son of Yelü Abaoji, the first emperor of Liao Dynasty. An erudite and talented man, he was assigned to important positions by Genghis Khan (the first emperor of Yuan Dynasty) and Ögedei Khan (the second Yuan emperor), and attained the rank of Secretariat Director. He laid down a code of conduct for the sovereign and the subjects for Mongolia, reformed all corrupt customs, and abolished the practice of slaughtering the people of a conquered city. He practically built the framework of Yuan Dynasty, which gave him a prestigious posthumous title Wenzheng. Zijin stones are found in Linqu in Shandong. This inkslab is made of top-quality stone, with a purple, smooth surface. Zijin stones are found in Linqu in Shandong. This inkslab is made of top-quality stone, with a purple, smooth surface. It has two feet in its front and a backward inclining water reservoir. There are apparent traces of ink left on its top. There is an incised inscription in five lines on the reverse side, with incomplete characters and the signature Yuanzhang. The inkslab, which had been damaged when unearthed, was discovered at the ruins of nobles' residences dating back to Yuan Dynasty at Houyingfang in Beijing. 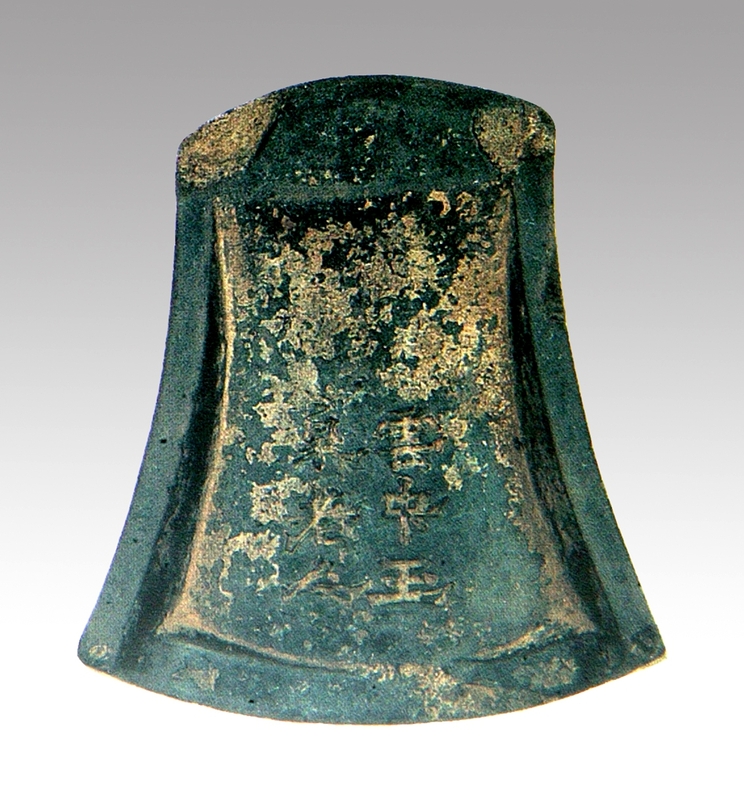 The cultural relics dating from the Neolithic Age unearthed together with it suggest that they were all collected as antiques by Yuan nobles. Zijin stone inkslabs had been rare after Song Dynasty, and this is the only one marked with the signature Yuanzhang. It is mentioned in History of Inkslabs, a book by Mi Fu, a famous Song calligrapher and painter. Mi Fu (1051~1107), with original name Juan and courtesy name Yuanzhang, was born in Taiyuan, Shanxi, and moved to Xiangyang in Hubei, and spent his old age in Zhenjiang, Jiangsu, therefore also calling himself a local of Wu (ancient name for Jiangsu). He was made an imperial academician in painting and calligraphy by Emperor Huizong, and held an official rank in Ministry of Rites. Skilled at writing poems and essays, he was an excellent painter, calligrapher and connoisseur. He achieved the highest level in running and cursive scripts, which, inspired by Wang Xianzhi's works, were elegant and uninhibited. He was one of the Four Song Masters, the other three being Su Shi, Huang Tingjian and Cai Xiang. 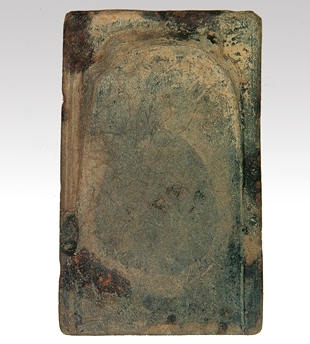 This chengni inkslab, an ornament on a writing table, is modeled on tile-shaped inkslabs made in Han Dynasty, with a lightly depressed middle part and a rough surface. 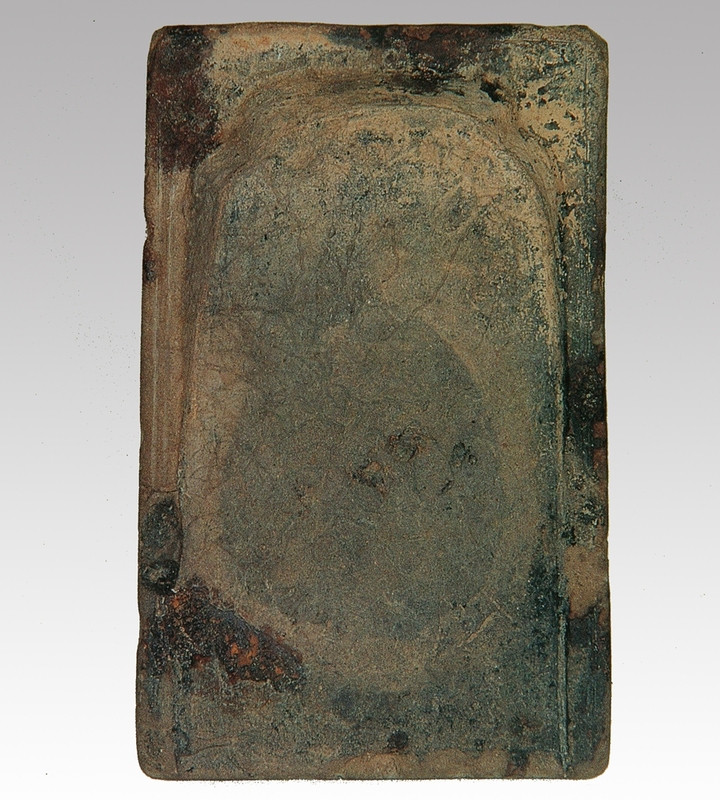 This chengni inkslab, an ornament on a writing table, is modeled on tile-shaped inkslabs made in Han Dynasty, with a lightly depressed middle part and a rough surface. It was unearthed in the vicinity of Beijing Zoo in 1969. 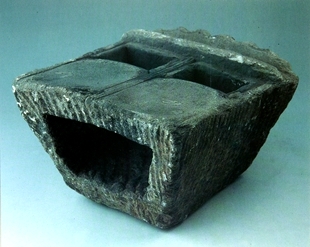 This is a rectangular inkslab made of ceramic. It has a simple shape, with a flat water reservoir, and is covered with earth stains. 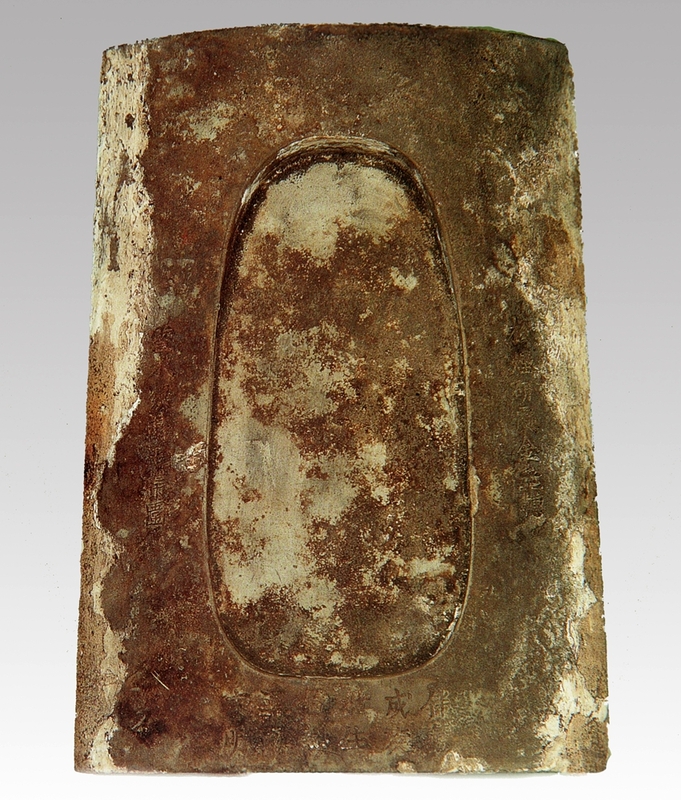 There is a rectangular raised inscription at the bottom indicating that it was owned by Shi Siyan from the southern gate of the West Capital, who might be an official in Chang'an. As recorded in a Ming book by Gao Lian, "Tang Dynasty chengni inkslabs are of the topmost quality, but unfortunately few have been handed down." That is to say, such inkslabs had become a rarity by Ming Dynasty, and today they are even rarer. Judging from the appearance of this one, Tang chengni inkslabs, having yet to come of age, are far inferior to those made in Song Dynasty. This is a she inkslab shaped liked the character for "phoenix". The water reservoir is connected with the inkwell, with the former being deeper than the latter. 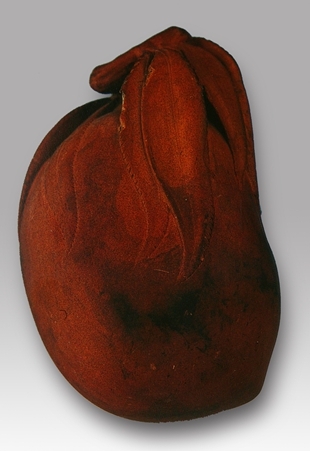 This is a she inkslab shaped liked the character for "phoenix". The water reservoir is connected with the inkwell, with the former being deeper than the latter. The top of the back bulges to be a semicircular shape, and there are two feet at the bottom. The inkslab is made of top-quality shuiboluo-patterned stone, the surface of which appears uneven but feels smooth. The stone, which is a kind of slate, does not lend for carving, and Tang ink stones of such a large size are rare.